.ca Canadian domain registration - Register your canadian domain name here! Try a live real time demonstration of our web hosting and email control panel. Included for every client as part of your domain administration panel. Thank you for considering CanReg.com as your future Web hosting and E-mail service provider. Getting started is easy, all you need is your domain name and a hosting plan. Migrating a site to us is easier than ever with our Easy Move service. If you have any questions at all please contact us for personal assistance. If you already have a domain name registered at CanReg.com continue to step 2. For new domains visit our Domain Registration Page. During registration you will be asked if you want hosting, just click yes to that option. If you have a domain registered at another registrar you must first transfer to CanReg.com. Visit our domain transfer page to get started. Review the hosting plans we offer to find the plan that suits your needs. You may always change the plan at a later date. View the Web Hosting Plans - Key Features. Things to consider. The free hosting plan is a very popular option. In most cases it will be enough to handle most websites. Why should I upgrade? The two most common reasons that people upgrade are E-mail and Extra Features. While the free plan offers one email address, it is limited to a forward only account. All paid hosting plans offer fully functional POP3 and SMTP email accounts including webmail. 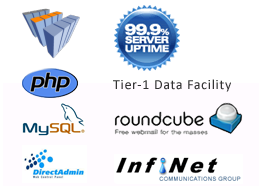 The extra features of the paid plans add a huge amount of versatility to your hosting control panels. View the Feature Matrix to see which features come with each plan. Web hosting is activated through the domain administration panel. From the My Account section click on the "activate" link beside the domain you wish to host in the My Web Hosting section. The signup process is very fast and you will have access to the domain hosting features in just minutes. Notes about DNS During activation you will be prompted to update the DNS to CanReg.com. If you already run a website and email at another provider you should say NO to this option to prevent any downtime. Once you have a duplicate copy of your site and email running on the CanReg.com servers you can update the DNS and cancel your services with your old provider. We can suggest two ways to migrate your hosting to CanReg.com. Consider our Easy Move service. Or if you have a webmaster or manage your site follow our tips to site migration guide.